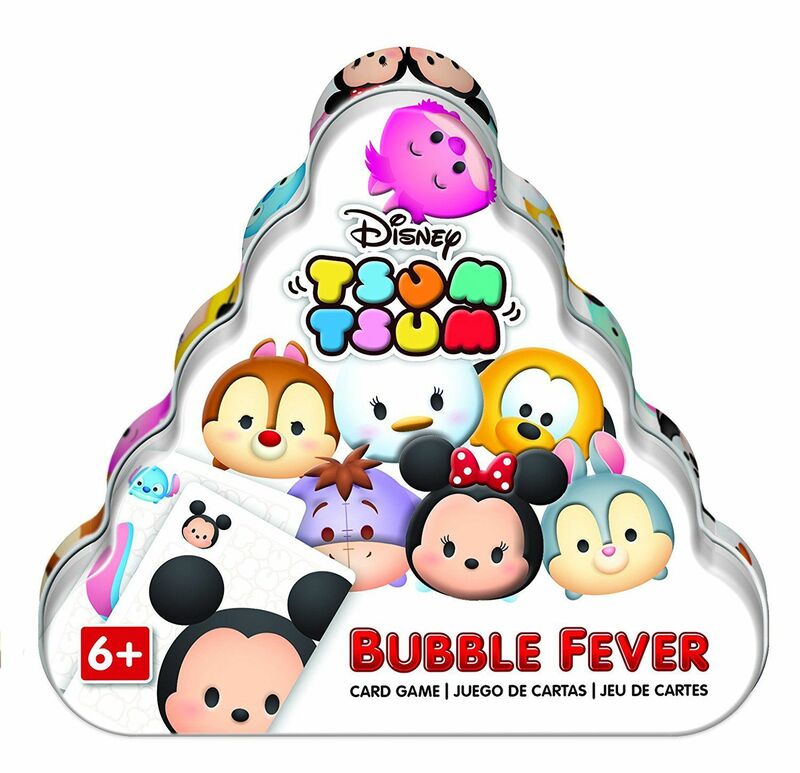 Fast-playing family card game, based on the popular Disney Tsum Tsum franchise. "It's a fast-paced race to stack matching Tsum Tsums! Pop the piles with bubble cards to score big, but be quick as every pile is up for grabs!" Each player has a small deck of cards, which they cycle through as quickly as they can, playing matching card types on one of three stacks in the middle of the table, non-matching cards must be played to your discard. Keep adding cards to make the stack worth more, but anyone can claim any stack. Claim a stack with a bubble card (each player has a separate set), to big score points! If you flip over a Starter Card when there are fewer than three stacks, you must play it to the middle of the table to begin a new stack. Game continues until each player has exhausted their supply of bubble cards. Scoring: Positive points for captured cards (3 points for Large Tsum cards, 1 point for starter, bubble and regular Tsum cards). Negative points for cards left in your deck or discard pile.